With the 2012 World Series of poker nearly upon us the poker community is gearing up for the 6-week long tournament series, but in the interim there was still plenty of headlines happening in the world of poker over the past week. Here is a look at the big stories from the past week that you may have missed. PokerStars purchase of Full Tilt Poker done by Wednesday? Three weeks ago poker players were getting ready to cash their checks from Full Tilt Poker after the a number of sources began circulating the rumor that PokerStars would be purchasing the beleaguered company after their deal with Groupe Bernard Tapie fell through. Now it appears that a new set of rumors has begun, as multiple outlets are reporting that the deal will be done by May 23rd (a smaller number saying the 25th), so it’s still possible that the deal could be announced before the 2012 WSOP. 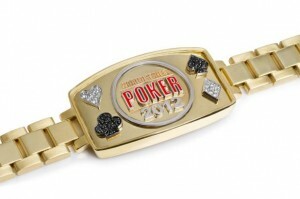 On Thursday the WSOP gave poker fans their first look at the new bracelets that will be awarded to WSOP winners in 2012. The 2012 version of the most coveted prize in poker was designed by Jason Arasheben, AKA Jason of Beverly Hills. The bracelet [seen in the picture at the end of the article] will be awarded in all open events, while the Main Event, the Big One for OneDrop, and the Ladies Tournament will feature specially crafted bracelets. The nomination process for the Women in Poker Hall of Fame Class of 2012 is now open, and poker fans are encouraged to visit the WiPHOF website [www.womenspokerhalloffame.com] and fill out the brief nomination form for their nominee. You can read our complete write-up on the WiPHOF HERE, where you’ll find the criteria used for selection, as well as taking a look at the past inductees into the WiPHOF. With the Launch of the Revolution Gaming Network scheduled for June 1, 2012, Lock Poker has been busy announcing what players can expect from their new network (which is the old Cake Poker Network). This week Lock Poker announced that they would be bringing back the Ronin Rake Chase, offering up to $1 million in prizes. Later in the week Lock Poker announced that the Revolution Gaming Network would be offering 36% rakeback to all new players at the network. This entry was posted on Friday, May 18th, 2012 at 7:28 am and is filed under Poker News. You can follow any responses to this entry through the RSS 2.0 feed. You can leave a response, or trackback from your own site.